(Phys.org)—A new analysis led by NASA's Jet Propulsion Laboratory, Pasadena, Calif., has estimated how much the growth of plants worldwide is limited by the amount of nutrients available in their soil. 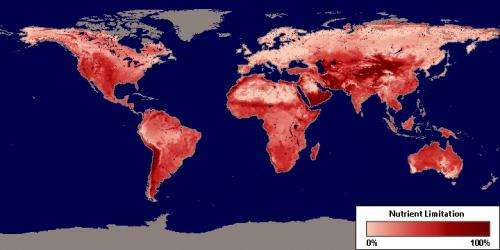 The maps produced from the research will be particularly useful in evaluating how much carbon dioxide Earth's ecosystems may be able to soak up as greenhouse gas levels increase. 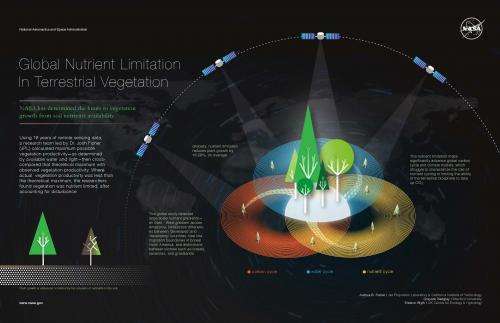 NASA has determined the limits to the growth of vegetation around the world based upon the availability of nutrients in vegetation soils. The nutrient limitation maps significantly advance global carbon cycle and climate models. "We were able to detect known regional gradients in nutrient levels—an East-West gradient across Amazonia, fertilization differences between 'developed' and 'developing' countries, and the migration of trees in boreal North America, for example," said co-author Grayson Badgley of Stanford University, Palo Alto, Calif.